Industry experts and physicians who have traversed the terrain lend their thoughts on how to approach this exhausting journey. Those who have been through the process of implementing an electronic medical record (EMR) agree that having the proper information and support before, during, and after implementation can make a world of difference to its success or failure. Organizations such as HIMSS and the Medical Records Institute have myriad resources available to assist those undergoing an EMR project. Mary Griskewicz, MS, FHIMSS, senior director of ambulatory information systems at HIMSS, is a strong proponent of clinicians using technology to improve quality and patient care. “Physician practices have immense challenges with the current economic environment and reimbursement issues. I haven’t met one physician who ever said they don’t want to provide the best quality of care possible to their patients,” says Griskewicz, who finds many of these same physicians are asking how implementing an EMR can improve patient care. HIMSS supports these physicians by sharing information that will help them in their decision-making process, even recognizing ambulatory practices that have done an exemplary job in their EMR implementations. It has also created a new Physicians Community that provides doctors with a peer-to-peer HIT forum where they can find out more about EMR strategies. “Physicians by trade didn’t get into the business of IT. Learning about information technology comes as an added responsibility,” says Griskewicz, who points out that implementing IT is a cost to practices’ business side, as it is with any company. Griskewicz says physicians considering implementing an EMR must conduct a needs analysis. For example, they must ask themselves: Do I have a business plan that includes implementing an EMR? Will I need a consultant to assist us? Do I have someone on staff who is capable of understanding and using HIT? Should I buy software as a service if I’m not staffed to support HIT? She also recommends having a physician champion the project. “Know that a dedicated employee must allow a certain percentage of their time for the project, as well as a certain percentage of the practice capital for software, connectivity, and hardware requirements,” she says. She adds that the sponsor/owner must identify success metrics and have a process to look for constant quality improvement through all phases of the project. “They have to realize that once they think they’re done, they are not done because they may continue to change requirements based on the practice and patient needs,” says Griskewicz, noting that EMRs are often deinstalled because the commitment is underestimated. She also emphasizes the importance of knowing where to go for help. HIMSS offers a voluminous amount of resources—from its EMR Fact Sheets to its monthly newsletter, Digital Office—that offer practical advice for anyone who is considering or is in the midst of implementing an EMR. “Some practices worry about getting right into the technology rather than planning for it. This is about using the technology to transform your practice,” says Griskewicz. Claudia Tessier, RHIA, vice president of the Medical Records Institute and a longtime e-health proponent, has been a powerful voice in the industry as it attempts to establish solid footing in an electronic environment. “The EMR means different things to different practices, but generally practices adopt EMRs to increase revenues, decrease costs, improve care, and improve their quality of life,” she says. In the adoption life cycle, the first, simple rule Tessier mentions is “know thyself.” In other words, practices must have an understanding of their patient model, workflow, expectations, and goals for improving the practice. “Before you start looking [for an EMR platform], know what you need and what you want to achieve, whether it be increased income, the ability to work remotely, or increased competitiveness in the market,” Tessier says. It’s also important to get a handle on financial planning goals, including devising a workable budget and calculating an estimate of the practice’s return on investment. Much like any other purchase, it’s critical to understand the features and functionalities of the prospective EMR. “What do you want from it? E-prescribing? A stand-alone system? Is it compatible with the practice management system you have in place already? These are among the important factors to consider,” says Tessier. The Medical Records Institute provides physician groups with access to several resources regarding EMR implementation, including EMRCompare, a Web tool that allows physicians to analyze different components of various EMRs. Ideas and advice from experts are invaluable, but nothing can replace the experience of actually adopting an EMR. The following practices have had various degrees of success in researching and implementing EMRs, some with great ease and others with much difficulty. All offer practical tips on how to make the process as simple as possible. James Saul, MD, attributes some of the success enjoyed by his three-member internal medicine practice in Cleveland to luck but, in reality, he followed many of the prudent recommendations mentioned by Griskewicz and Tessier. Saul began the process in February 2004 when he explored the EMR that was recommended for use with the practice management system his organization already had in place. “It was important that the EMR we chose had to integrate with the practice management system. That is a key piece of advice I’d recommend to anyone looking into EMRs,” he says. Saul used the vendor’s demos to decide whether it had the functionality he was looking for: Could he develop templates easily? Was it intuitive? How did it fit in the flow of how the physicians saw patients during the day? Was the price right? After answering yes to each question, he implemented Spring Charts EMR from Spring Medical Systems. Since implementing the EMR, Saul says transcription costs have decreased dramatically. “But it’s more than just a documentation tool. It needs to be looked at as not just another way to save on transcription. It’s so much more,” he says. In fact, the EMR has helped the practice operate more smoothly and efficiently. “Staff can send messages straight to the screen to do such things as order tests or scripts. I can immediately address them with a click of a mouse and send them back, which eliminates a lot of the manual tasks associated with pulling charts,” says Saul, who enjoys having no charts to deal with on his desk at the end of a busy day. Because of this improved efficiency, he is now able to see a few more patients each day, which incrementally adds up to increased revenue for his practice. Saul credits this to using the EMR day to day. He recommends committing to using the EMR exclusively, although it may seem daunting at first. “When I committed to using it exclusively, after a week or two, it was faster than using the tape recorder. Once I began using messaging, had the ability to work remotely, and could actually go home at the end of the day, I didn’t have to sell it to my coworkers—the benefits sold themselves,” he says. Saul says technology glitches created by such things as power outages won’t be catastrophic if a practice is prepared for such an event. “Have a go-to person you can call to get the system on immediately. If you can’t do it yourself, make sure you have someone in place to help within minutes,” he says. Among the many EMR features to choose from, Saul says e-prescribing should be among the must-haves. “I was using a third party before, and while the program was great, it was inconvenient because we had to enter the information twice. So now it’s a one-step process,” he says. Paige Pollard, OD, serves as the EMR administrator for implementation at Reagan Eye Center, where a NextGen Healthcare Information Systems EMR has been up and running since August 2007. With its four sites in Waxahachie, Tex., networked and operating off remote servers, the technology creates added efficiency for the practice. “I basically spent one day a week in training or manipulating the system, which worked well because I knew what our exams were like and could configure the EMR to match the way we work,” says Pollard, adding that the template editor and document builder features included with the software are exceptionally useful for her practice. “It’s set up very well, and it can be manipulated in a way that enables you to record things the way the exams are performed,” says Pollard, who also likes having a task box available as a virtual to-do list for herself or coworkers. The EMR automatically supplies the coding for services performed during exams, which has improved revenue. “When I first saw the increase in revenue, I was a bit worried but then realized that the EMR captures codes more accurately and gives you more than you might typically give yourself,” says Pollard. There has also been increased efficiency across the four networked sites, where they no longer have to fax charts between facilities, which saves time. Giving the staff plenty of time to familiarize themselves with the EMR and offering enough training, practice, and support is critical because employees will naturally have different levels of computer experience. “It’s important to be as comfortable with it as possible. On the day you go live, make sure you have no other plans,” she says. 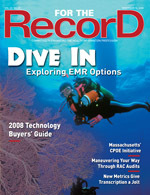 Due diligence when choosing an EMR is something with which Carol Teplis, MD, is quite familiar. As a partner in a pediatric group practice in Elgin, Ill., she began her search for an EMR in 2005 after reading about how other practices were making strides by adopting the technology. With several other doctors on staff at her local hospital, Teplis planned a small EMR demonstration meeting. “The hospital administration became interested and coordinated a meeting at a conference center nearby where 11 vendors demonstrated their EMRs. This sort of meeting brings EMRs to a site where physicians from local small group practices can look at and compare examples of the technology available on the market. And unless you look, you don’t know what’s out there,” she says. In continuing her search, Teplis attended a conference specializing in EMRs. “Prior to the conference, I contacted the person in charge and got a list of the EMR vendors. Then I contacted each vendor and asked for references from my specialty to speak with so that I could develop some kind of perspective before I even attended the meeting,” she says. Teplis asked the references questions such as what they might do differently, the ease of use in modifying the program vs. its capabilities out of the box, how long they’ve been using the system, and, ultimately, whether they would buy the system again. She was also curious about what enhancements could be available in the future. “It’s an evolving science in keeping up with electronic medical information, so you want to see where the vendor is going and what’s on the horizon. There are so many evolutions of technology, and I wanted a product that would be keeping up with what was on the forefront,” says Teplis. Teplis also recommends that when a vendor comes to demonstrate an EMR, have it provide references of users in your particular specialty and develop patient scenarios germane to the practice to see how it works in those cases. “The vendor might have a great EMR, but it might not have the features you want for the kinds of patients that you see,” she says. Teplis also points out the importance of deciding whether to go with the current practice management system’s preferred EMR or to change systems based on a particular EMR’s benefits. It may even be worthwhile to determine whether it’s possible to connect the two separate systems. In other words, practices may have to decide between a single-vendor solution and a two-vendor system. “Even with open source software, when you have two systems talking, inevitably you will still have problems. Getting two systems to marry and communicate is a complex step,” says Teplis. The cost of an EMR, including hardware and infrastructure requirements and implementation and training fees, can present an enormous financial burden for the average practice. With the squeeze on doctors today to accept lower reimbursements, bundled services, and the omission of payments for various services performed, finding the cash to bring a system into an office is challenging at best. Currently, it is the financial issue that is keeping Teplis’ practice from choosing and implementing its EMR. With the cost of the technology reaching anywhere from several hundred dollars to as much as $50,000 per doctor to start and annual maintenance fees running as much as $5,000 to $10,000 per doctor per year, the price tag ultimately prevented her group from moving forward. However, Teplis does foresee getting one up and running in the next two years as a matter of necessity. “Increasing demands on physician practices to meet patient care expectations, insurance and Medicare practice benchmarks, and simply keeping up with all of the information about any single patient will drive physician practices to begin using EMRs in the very near future,” she says.